Chabad of East Hampton is dedicated to providing every Jew regardless of background, philosophy or level of commitment, an open door environment for strengthening and enhancing Jewish family life. Chabad serves individuals and families looking for an anchor and non-judgmental, accepting, personalized Jewish experience. 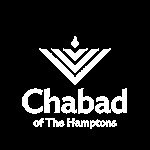 Chabad Lubavitch of East Hampton - is part of the worldwide Chabad Lubavitch movement. Our center is a unique organization helping ensure Jewish continuity by fostering Jewish awareness, knowledge and practice through outreach, education and social services. We provide a wide range of programs and services to the local Jewish community.